A night cream plays a key role in keeping our skin soft, hydrated and improving the overall skin texture. Believe me, it’s a herculean task to choose the best night cream amongst the vast array of options available in the market, nowadays! I got this Vitamin E night cream from Fabindia brand in August, last year and it happens to be my first ever night cream ‘OFFICIALLY’!. So read the full post to know whether I am impressed with it or not! 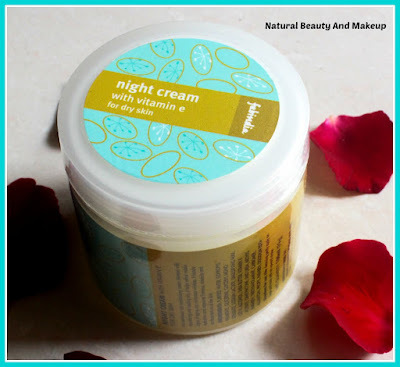 Night cream with vitamin E for dry skin. An extremely rich moisturizing cream blended with nourishing and healing oils, it helps refine visible signs of ageing and minimizes wrinkles. It boosts hydration and improves firmness, elasticity and surface texture of the skin. Claims: It claims to help refine visible signs of ageing and minimises wrinkles. It improves firmness, elasticity and surface texture of the skin. 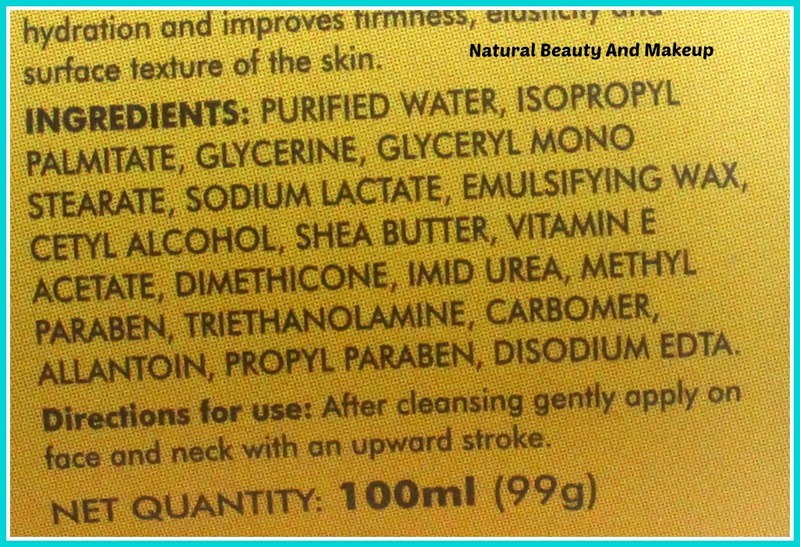 After cleansing, gently apply on face and neck with an upward stroke. The night cream comes in a plastic tub, secured with a top lid screaming the product name and inside an additional lid is there to avoid any product spillage. The packaging is total spill proof thus travel convenient. All the necessary information is printed on a sticker attached to the product itself. In short, the packaging has a decent look. 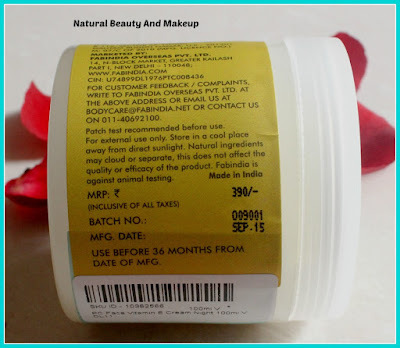 Fabindia Vitamin E night cream is white in colour and has a soft, smooth, creamy texture. It has a sweet fragrance which fades away soon post application. 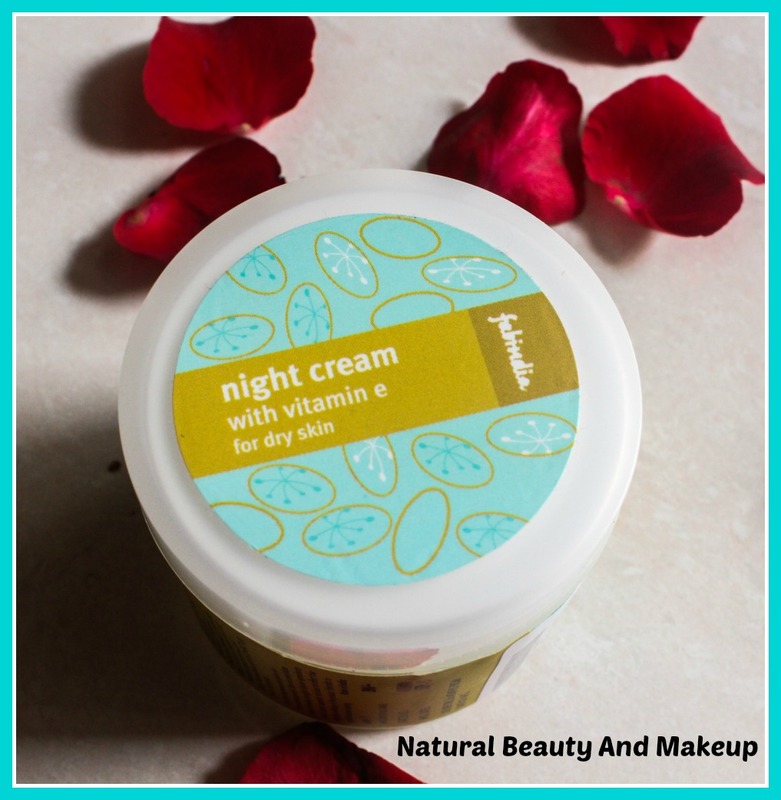 Prior to this night cream, I would use a medicated Cream (Elovera), a rich moisturising cream as my night cream which worked great for my combination skin. We all know that nothing should be used on our skin for a long time, so I had to look for other alternatives. It’s that time when I stumbled upon this night cream which is raved by many bloggers and that was enough to persuade me to try out this product for a change. The smooth creamy texture allows it to blend into the skin like a dream without leaving any greasiness effect. 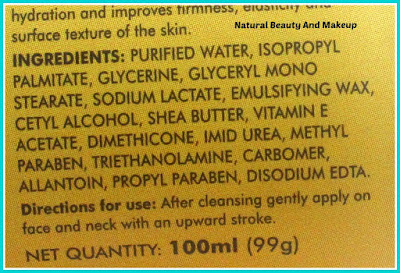 I have been using the cream since last summer time and till date, I have found no issues with this one except the ingredient list. Although, it contains maximum not-so-good components (read PARABEN, ALCOHOL & EDTA) but I am amazed to notice that how well my skin responded to this cream (I don’t know how and why honestly)! After cleansing my face, I take a dollop of this night cream and massage slowly on my cleansed face giving upward strokes. It spreads evenly & sinks into the skin quickly imparting a soft, moisturised and a matte look. Since this is a non-greasy cream, even oily skin beauties can use it without worrying about skin breakouts. It didn't cause me any breakouts no matter how much quantity I slathered on my skin and the best part, the sweet lingering aloe vera fragrance makes all the massaging process more soothing and relaxing. Every morning I wake up with a softer, plumper and an even toned face. The claims of improving the skin texture and firmness hold true in my case! However, I do not have wrinkles or ageing problem as of now, so cannot comment on this. Overall, I quite liked the product. 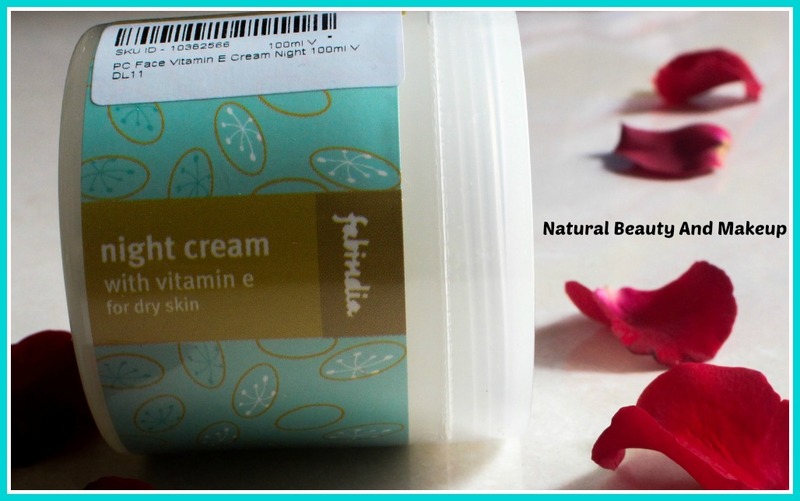 Fabindia Vitamin E night cream mentions that it boasts of all nourishing and healing oils which caught my attention at first glance! On the contrary, it lacks all the key ingredients like retinol, glycolic acid or hyaluronic acid, which are supposed to be the most essential active components for a night cream, rather contains maximum harmful chemicals! I wish it were infused with only good active ingredients, truly disappointed in this aspect! Although, my skin reacted really well to this cream but I ain’t going to repurchase it ever. 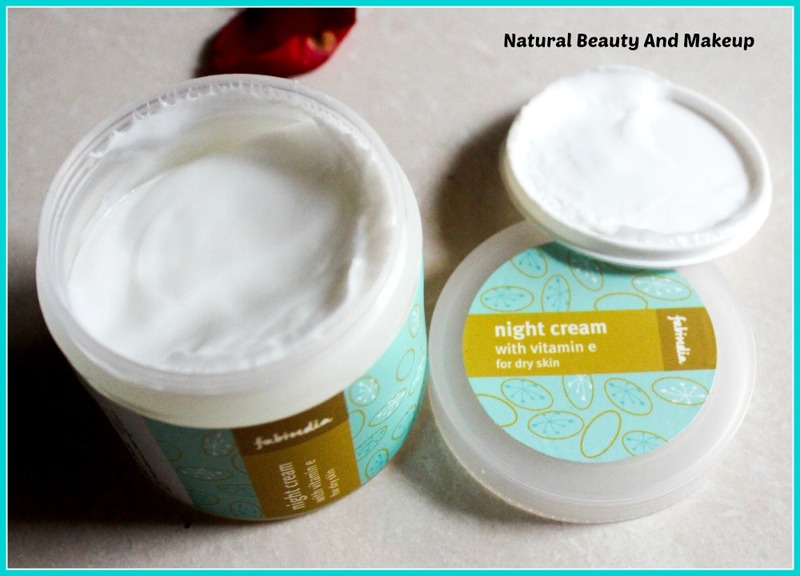 My hunt for the best night cream be organic or herbal is going on and I hope will get it soon. If you are not obsessed with ‘all natural’ thing, then you can give this night cream a try definitely. Hope you find this review helpful and do let me know your favourite night cream in the comment section below. 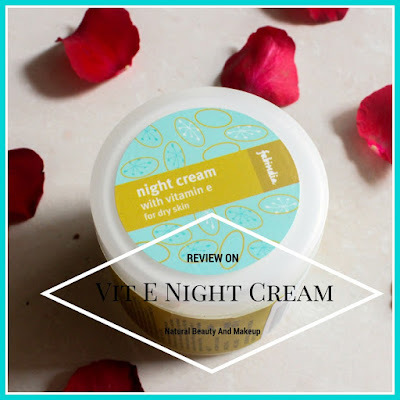 I like your honest review, I also believe night cream plays an important part for a healthy skin. Lovely review. Glad to hear that it worked well for you.